Cold and Flu Masks: Why Wear One? In response to cold and flu concerns of all types, the Center for Disease Control and the World Health Organization have advised that wearing a mask is a “first line of defense” and advise that “in a highly contagious environment, wearing any mask is far better than wearing no mask at all”. Many Hospitals and Doctors are now requesting that patients (especially with low immune systems) and visitors wear masks. Many companies and schools, in an effort to reduce absences, are providing masks for employees / students to wear during cold and flu season. In any type of flu transmission, inhaling germs is but one way to become infected. Contamination may occur simply by touching the corner of your eye, nose or lips with contaminated hands. Therefore, the wearing of any mask is primarily a “first line of defense” and should be combined with frequent hand washing and good hygiene. The greatest cause of absences in school and the workplace was due to employees coming to work while they were sick. A 1998 study on absences from school and the workplace due to cold and flu concluded the most effective means of reducing time loss was for students and employees to wear a mask, especially when they were sick! Wearing an antibacterial, moisture wicking, washable Breathe Healthy germ mask helps protect against the spread of germs. The EPA estimates that indoor air in the home and at work may be up to 10 times more polluted than the air outside. During the allergy season, wearing a Breathe Healthy Mask can help reduce exposure during the peak times for allergens. The average person breathes more than 18,000 times a day and every breath carries tiny particles into your lungs. Wearing a Breathe Healthy Mask can help reduce the amount of particles you breathe. According to the World Health Organization, as many as 50,000 Americans may die each year from inhaling airborne pollution such as dust and soot. Wearing a protective face mask when you travel is endorsed by the World Health Organization. U.S. State and Federal Health Agencies, Hospitals, and Physicians recommend wearing masks for numerous health concerns. Wearing a Breathe Healthy Mask can help reduce those concerns. Many countries now aggressively encourage citizens to wear masks during flu season and during days of particle pollution. There is a growing demand by hospitals and medical offices to require visitors and patients to wear a mask while on the premises, visiting patients, or waiting to be seen by the doctor. A Breathe Healthy mask can help protect both you, those around you, and the patients. Wearing a Breathe Healthy mask helps to protect against airborne germs from coughs and sneezes, the primary means of flu transmission. A Breathe Healthy cold weather face masks can help prevent loss of body heat in cold weather and help prevent an asthma attack. Breathing cold air is a major contributor to asthma attacks. A Breathe Healthy cold weather face masks is made with double layers of fleece that can be reversed when moisture accumulates in (a major problem for most cold weather masks). Further, our cold weather fleece mask is easy to breathe through, which is especially important to COPD sufferers who can not deal with the breathing resistance associated with many other cold weather masks. Additionally, we are told by many of our COPD customers that our cold weather face mask is one of the few that will fit over a cannula. All partial face masks should be considered a “First Line of Defense” when it comes to the flu. Equally important to wearing a face mask is frequent washing of hands. For maximum protection, wash hands before putting on a mask and after taking it off. Also, cold and flu germs can enter the body by contaminated hands touching the corners of your eyes, your lips and your inner nose. When handling any mask that has been worn, wash your hands immediately thereafter or use Breathe Healthy’s Antibacterial/ Antiviral mists. 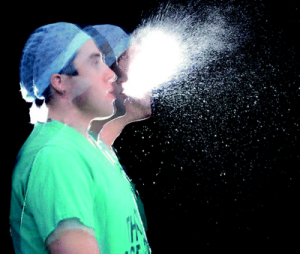 Weak immune system patients should wear masks when in situations where you are exposed to airborne germs. Consult your doctor to see if a Breathe Healthy mask is appropriate for your level of immune deficiency. From the Mayo Clinic: Should I Wear a Flu Mask to Protect Myself from the Flu? It can’t hurt and it might help. A recent study in The Journal of Infectious Diseases found that wearing a surgical mask and using an alcohol-based hand sanitizer helped reduce the number of influenza-like illnesses in a group of students living in a college dormitory. Another group of college students in the study used face masks alone, which also helped prevent influenza — but not as much as the combination of face masks and hand hygiene. People who live in community housing — such as college dorms, nursing homes or military barracks — are at higher risk of influenza infection because they’re in contact with more potentially infected people. Flu masks may help block airborne germs, and they may also forestall the transmission of germs from your hands to your mouth or nose. However, the best way to prevent influenza is to receive the flu vaccine, either via an injection or nasal spray.